This is a JHS Superbolt clone! JHS is not one of the most honest builders on the planet, and he is known for his ability to steal circuit designs from other builders. The Superbolt is no exception, and is in fact a really slightly modded Run Off Groove Supreaux. Runoffgroove is a community creating circuits for DIY people, and making it public through Creative Common license. There are many nice circuits there, take a look! JHS did not bother with the license and just copy it and started to sell it. 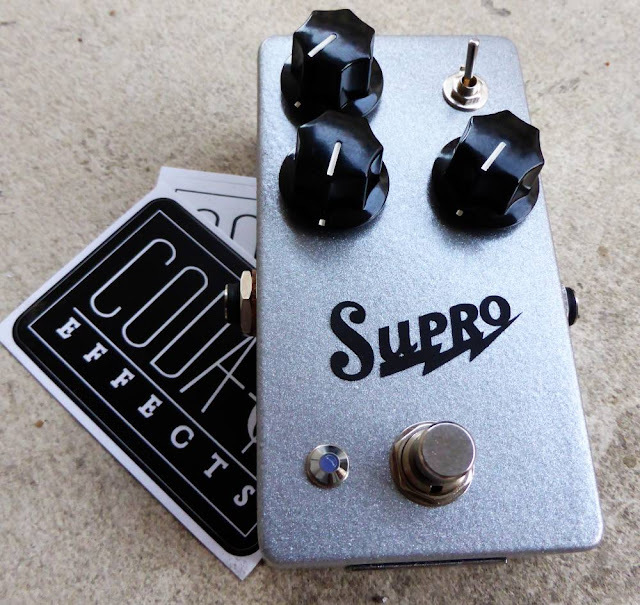 The circuit is inspired by an old class A amplifier, the Supro 16T. It is a small 5W amplifier from the late 60s. It became quite famous, because like many other class A amplifier, if you push the volume really loud, the amp begins to distort in a really nice way. It was used in studio by many guitarists, especially by Jimmy Page who recorded several Led Zeppelin songs with it. I decided to make a clone, mainly because some videos on the web of the Superbolt were really good sounding. I used a prepainted grey enclosure from Banzai Music, and the "Supro logo" was laser cut by HPM Laser. The pedal has 3 knobs: gain, which acts like the volume of a class A amp: the higher it is, the higher the volume and the saturation. The volume knob acts as a master volume; the tone knob add or remove bass and treble (slightly). There is a two positions switch that allow you to switch between a gainy bassy position, and a slightly less gainy with more treble position. The build is quite simple. However, I went through many problems doing it. At first the pedal was not working at all, then only a huge buzz came out of this box... I checked everything several times and was quite despaired about it. So I let it aside on my bench for a few weeks... And finally decided to make it work! The audio probe was really a life-saver on this build. It is a bit messy inside, but not that much for a veroboard with 3 pots layout. At first I was planning to have space for a battery, but the input jacks were too big for that... So 9V power supply only! Adjusting the 3 trimpots was quite easy. I started with 9V on the emitter of each transistor, but this was too gainy in my opinion, so I diminished it (except for the last transistor). The pedal is thus less gainy. You can see that it is basically the same circuit, with an added voltage doubler (top part of the circuit), and a switch adding a 120k resistor connected to the ground before Q3. You can see that it looks a lot like an amplifier! It is really inspired by an amplifier schematic, except that tubes are replaced with JFET transistors. Which is really appropriate because JFET transistors (Junction Field Effect Transistors) use a technology that is really close to tubes, and they sound quite "tube-like" when saturating: warm, creamy overdrive compared to the aggressive gritty saturation of silicon transistors. All the saturation of this circuit is based on the saturation of these transistors: you can see that there are no diodes in the circuit. It is different from what we are used to with the Big Muff or the Jan Ray (Timmy). 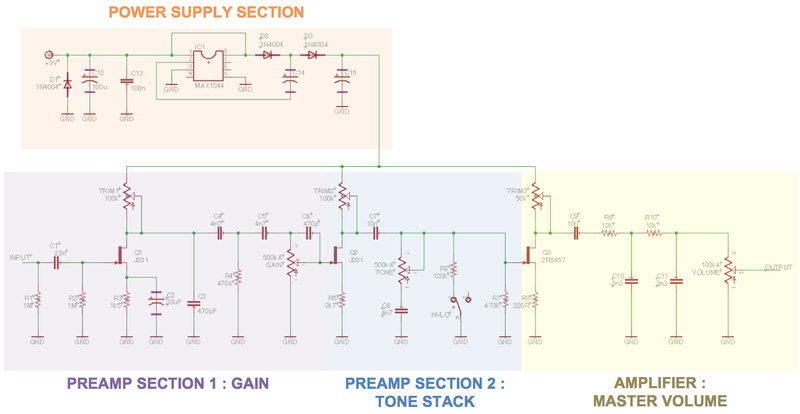 To sum up, it works like this: the first preamp section amplifies the signal, and will drive the second transistor. The saturated signal will be slightly modified in tone by the tone stack section, and a third transistor will set up the final volume. Like I said, it really works like an amplifier! Let's see every part of the circuit in detail. First, there is a protection against polarity inversion with a 1N4001 diode, and voltage is stabilized with two capacitors. 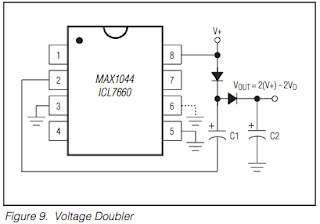 More information about voltage stabilization and polarity protection here. It is a very classical layout that you will find in most pedals using a voltage doubler (Klon centaur for instance). First, there are two 1M pulldown resistors. Pulldown resistors prevent loud popping noises when you turn the effect on. There is a 22nF coupling cap that prevents any parasitic DC current from your guitar to go through the circuit. The signal is amplified by the first transistor (Q1). You can see that the overall gain of the transistor can be adjusted with a 100k trimpot that will adjust the DC current on the drain of the transistor. That way, you can set what the maximum gain of the pedal will be. The maximum possible gain is set also by the resistor R3 (1k5). 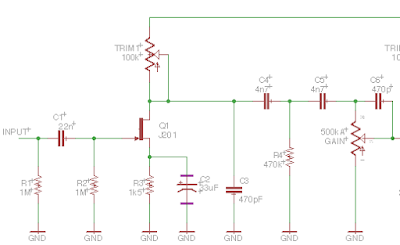 Then, the signal is filtered a bit by different means: a 470 pF capacitor connected to ground let high frequencies going to ground, thus eliminating a bit of high frequencies. To eliminate more high frequencies, value of this capacitor can be changed to a bigger value like 560 pF for instance. A 470K resistor connected to ground will set the bass response of the unit, and will eliminate a bit of bass. 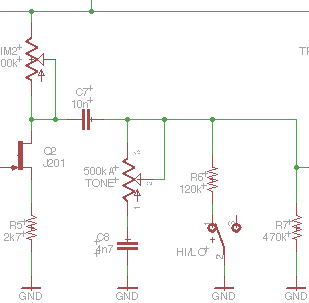 A potentiometer wired as a variable resistor will then set how much signal will go to ground. Thus, it defines how much the signal is amplified, and how much signal will drive the second transistor: it is the gain potentiometer! The amplified signal of the first section will then make the second transistor (Q2) saturate. The amplification of Q2 is also set by a 100k trimpot and R5 (2k7 resistor), and can be modulate to have more or less saturation. There is a 10 nF coupling cap to eliminate parasitic DC current remaining from the 18V bus, and then the signal is modified by the tone potentiometer. It is wired as a variable resistor connected to ground, and will eliminate more or less bass frequencies. An optional switch also allows you to connect a 120k resistor to ground, which will diminish overall gain (a part of the signal will go to ground), and bass response (more bass will go to ground than high frequencies with a 120k resistor). 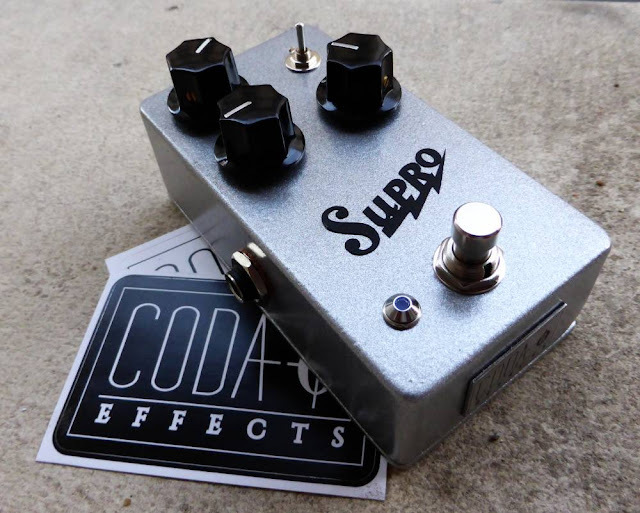 This allows you to simulate the two High and Low inputs of the Supro amplifiers. Again, a 470K set the maximum gain of this part of the circuit. This part of the circuit simply amplifies the final signal. The amplification is set by the 220R resistor and a trimpot (again). 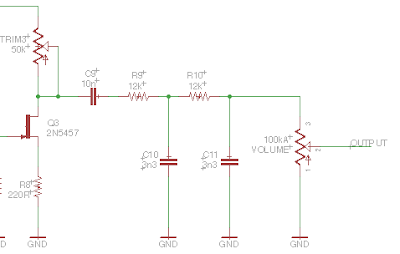 Residual DC current is then filtered by a 10nF capacitor. Final volume is set by a potentiometer wired as a variable resistor connected to ground, like we have already seen in many many circuit, like the Fuzz Face for instance. The higher the value of this resistor will be, the less signal will go to ground and the bigger the output signal will be: more volume! I hope that everything is clear, do not hesitate to ask question if some stuff is still unclear by posting a comment! Did you like this article? 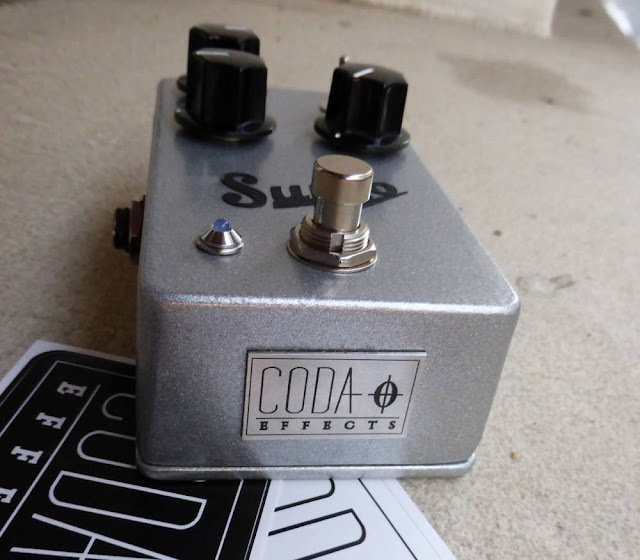 Like the Coda Effects Facebook page! Love this build! Could I pay you to build one for me? I am planning on opening a small "shop" section soon. This build will surely be in it. If you send me an email, I can contact you when it will be online. Thanks so much for taking the time to write about all this, it's extremely helpful. And great job building the pedals, they look amazing! I have built this circuit and no matter what i do it cuts too much bass. Which cap or resistor should I change. C4, C5, C6, and C9 seem to add a little bass back in when i increase them and look at it on a scope but I wanted to get your opinion considering the fact that you may have experience with this issue possibly. Hello ! I agree that there is not too much bass with this circuit. Actually, I find it a bit too bright for my ears. I never tried it, but I think that you can try to change the high pass filter formed by the tone pot and C8. Increasing C8 to 10 or 22nF would be a good starting point I think. Hi! 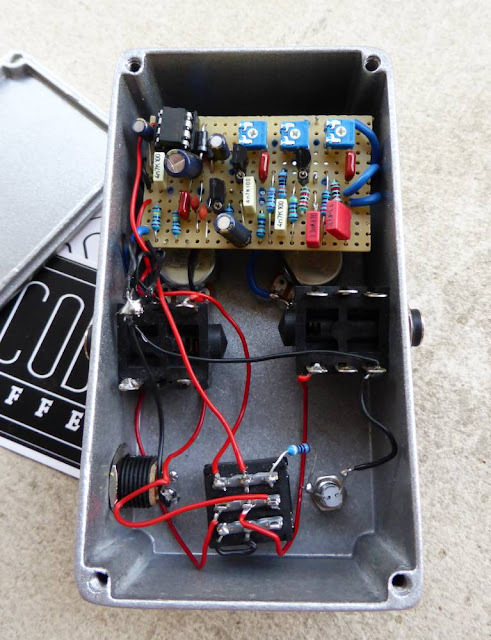 I built a Superbolt clone following the schematic but when I turn on the pedal it sounds very quiet, with a 30W Valvetronix amp with the master at full and the volume at full too it sounds quiet than 10w amp with the volume at 7 maybe... When the switch is turned to the bass position it turns more quiet. I revised the biasing but any suggestion is accepted. I think it could be a defective transistor or something related with them, I ordered a newer pair, I would be so pleased if you can help me! Thanks!! this might be a silly question, but I cant for the life of me figure out the cap values for the two caps after the voltage doubling IC (C14 and C15). Could you let me know what those are? Thanks! Hi there Benoit, thank you for all that you do! I was wondering if all the capacitors are getting hit with 18v or just some of them? I'm new to all of this. My 100u and 33u are only rated for 16v, but I'm not sure if they're getting 9 or 18v. Thanks! C12 and C13 are only 9V, however, for most of the other capacitors, there are chances that they get through more than 16V... Therefore, except for C12 and C13, I would recommend to use 25V rated capacitors. thank you so much for the in depth article! can you tell me how you set the 100k trim pots for each stage? are you just tweaking until you hear max gain?